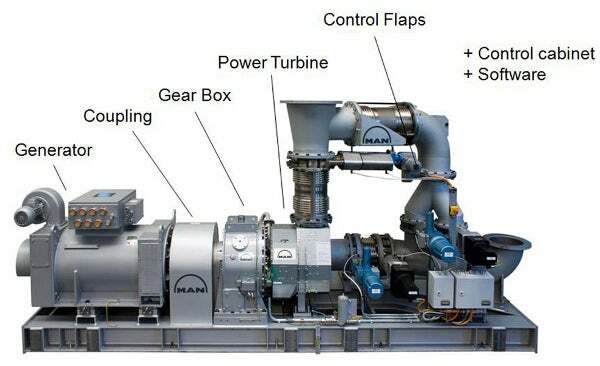 MAN Diesel & Turbo has won a firm order from China’s Samjin Shipbuilding for a pair of Turbo Compound Systems, including a Power Turbine and Generator (TCS-PTG). The TCS-PTGs will be installed on two 4,700 teu container vessels currently being built by Samjin. The vessels, which are powered by individual MAN B&W 6S80ME-C9.2 low-speed engines, will be operated by German ship owner Reederei Horst Zeppenfeld. According to the company, the order also includes an option for two extra vessels. The company said that along with the 2 + 2 × TCS-PTG20s, it will also supply 2 + 2 × TCA88 turbochargers for €4m. Delivery of the equipment is scheduled to start by the end of 2012. The order represents the first such instance for a marine application for MAN Diesel & Turbo’s new generation of TCS-PTGs after previous applications at stationary power plants in London and Panama. The installation of TCS-PTG units will help Zeppenfeld save fuel and also reduce the operating costs of their gensets. The company said that in many cases, the installation of a TCS-PTG unit also allows the user to minimise the installed genset power output and reduce corresponding investment costs. The TCS-PTG recovers up to 5% of the energy from a main-engine’s exhaust gases and as an alternative, the company offers an STG (steam turbine and generator) system that recovers energy from an exhaust-gas steam boiler. The company also offers a solution in the form of the MARC_HRSTM system, which is a combination of the STG and TCS-PTG that recovers up to 10% of the energy from a main-engine’s waste heat. Last month the company had also won an order to install its second-generation exhaust gas recirculation (EGR) system on a 4,500teu container vessel owned by Maersk Line. The EGR system will be fully integrated with the vessel’s main engine, a two-stroke MAN B&W 6S80ME-C9 type that will be built by Hyundai Heavy Industries’ engine and machinery division. The company said the new system enables the meeting of the imminent IMO NOx Tier-III emission levels that are expected to come into force by 1 January 2016. The EGR unit comprises a cooler, a scrubber and a water mist catcher and a blower unit, and is designed to be fitted on the engine in the same way as a charge-air cooler. The new vessel is in the C-class series of 22 container vessels ordered by the Maersk Line and is expected to be delivered in early 2013. The firm said that, for a test period of three years, the engine will be operated partly with IMO NOx Tier III emission levels. The EGR system ensures full fuel flexibility, ranging from HFO to distillates and natural gas, and reduces NOx by directing part of the exhaust gas back into the engine’s scavenge air. Caption: TCS-PTGs to be installed on two 4,700 teu container vessels will help Zeppenfeld save fuel and also reduce the operating costs of their gensets.